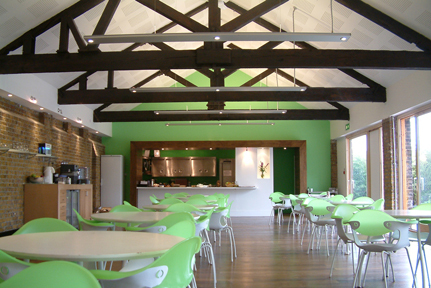 A former derelict outhouse building is converted to create a new dining and staff facilities space. The existing structure and industrial materials are retained and left ?raw? as salvaged archaeological remnants. New interventions are deliberately kept simple and low key using natural finished materials creating a relaxed and comfortable flexible space that can also be used for entertaining and presentations.